If you haven’t heard by now, the library will be re-carpeted during the next month or so (we’re starting with the lower level; the Childrens’ Department will be closed starting April 29). We will be closing some areas for limited times and programs may be rescheduled or moved. Some services will also be curtailed – such as holds on items in closed areas. If you have any questions, please give us a call at 733-2964, and we’ll let you know what’s going on. One advantage of all of this is that starting on Monday, May 2, the checkout period on books (including audiobooks) will be extended to 6 weeks. And we’re encouraging patrons to help us out by checking out the full limit of items – 50 – on their cards for the next month. We know that the project is going to inconvenience all of us for awhile, but we’re convinced it will be worth it. This month’s Way Back Machine doesn’t take us too “way back” (unless you were a millennium baby!). For most of us, 1997 is a year we can remember – Madeline Albright became the first female Secretary of State, Timothy McVeigh was convicted and sentenced to death for his role in the Oklahoma City bombing, and Princess Diana died in an automobile crash in Paris. On a lighter note, 1997 was also the year that introduced us to Harry Potter; the first UK edition was published in June. A Currier & Ives political cartoon (Library of Congress). Yes, I know “sesquicentennial” is a $5 word – hard to say and to spell. It simply means the 150th anniversary of something, and in this case it pertains to the American Civil War. On April 12, 1861, the Confederates fired on Fort Sumter, marking the first battle in a four year-long war that would see over 620,000 American soldiers dead, slavery ended, and a huge change in the way Americans thought of themselves and their country. Offers a close-up study of a pivotal year in American history and of seven noted American leaders who will play key roles in the the battle over slavery, the secession of the Southern states, and the events of the Civil War. Recounts the events surrounding the Compromise of 1850 and the part Henry Clay played in its passage by Congress. Harrold covers the many fights across the North-South borders, as well as newspaper writing that fanned the flames on both sides. Reassesses the role of the California gold rush in the events leading up to the Civil War, analyzing the squabbling over bringing California into the union as a slave state, the political maneuverings and battles, and the economic factors involved. Challenging popular beliefs about the moral aspects of the Civil War, an assessment of what the author believes to be economic causes for the conflict demonstrates trade and production pattern changes in the second half of the nineteenth century brought about by failures in farming and government diplomacy. Describes the eight weeks preceding the Civil War in the United States, discussing Lincoln’s inauguration, the attack at Fort Sumter, and Lincoln’s call-to-arms proclamation, in an account that also considers if the conflict could have been peaceably avoided. Examines events leading up to the Civil War, from Lincoln’s 1860 election, through Southern threats to secede, to the fall of Fort Sumter. Thomas essays the decision making of Abraham Lincoln and Jefferson Davis in bringing on war and concludes that neither leader, or side, appreciated the nature and costs of war and thus acted out of imagined results rather than informed assessment. Amongst the subjects that Stampp tackles are the inevitability of the Civil War and the truth about why the confederacy actually died. The other essays are a mix of historiography and analysis of issues including Lincoln’s role in reinforcing Fort Sumter, the impact of psychology in trading slaves, and the role of racism in the Republican Party (from product description). 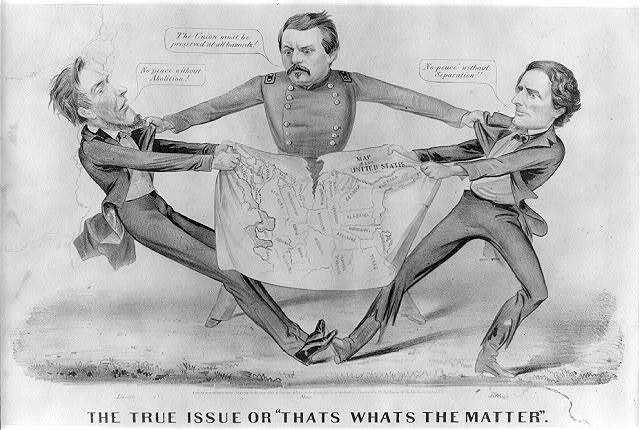 Discusses President Lincoln’s decision to go to war with the seceded South, and highlights how citizens, party activists, state officials, and national leaders in the North responded to the political crisis. A chronicle of the four months between Lincoln’s election and inauguration evaluates the decisions he made regarding slavery, secession, and the possibility of a Civil War, in an account that also offers insight into the selections of his cabinet members. Traces the monumental expansion of the American territories against a backdrop of pre-Civil War tensions, citing such contributing factors as the gold rush and the founding of the Church of Latter-Day Saints. A two-volume history of the events that led to secession of the South and to the Civil War focuses on key events and personalities on the road to war, including the Dred Scott Decision, John Brown’s raid on Harper’s Ferry, and the violence in Bleeding Kansas, and reveals how a minority of Southern radicals drove the South out of the Union. Hammond demonstrates that local political contests and geopolitical realities were more responsible for determining slavery’s fate in the West than were the clashing proslavery and antislavery proclivities of Founding Fathers and politicians in the East (from product description). The center could not hold amid a flood of passionate intensity recorded in this illuminating study of the 1860 election campaign. Historian Egerton (Death or Liberty) chronicles the year’s chaotic political wranglings, from the fractious party conventions that threw up four presidential contenders (two from minor parties) to the search for a congressional compromise to save the Union on the eve of Lincoln’s inauguration (from Publisher’s Weekly). Uncle Tom’s master sells him, separating him from his wife, and he becomes attached to the gentle daughter of his new owner, but after her death, he is sold to the evil Simon Legree.